Cigarettes are relatively cheap here. Greece is a bit of a smokers' paradise really. Tobacco products are quite cheap, particularly for people used to paying UK prices, and there is no smoking ban as such. Actually, that last bit is a lie. Greece has quite Draconian no-smoking rules which carry heavy financial penalties if they are broken. But no one gives a toss. Seriously, the rules concerning where you can and cannot smoke in Greece are every bit as rigid as those in force in the UK, but, as I have already said, no one gives a toss. At the weekend I was in a taverna with my other half and three friends. I was the only non-smoker and strictly speaking smoking in an enclosed place such as a taverna is illegal, but they all lit up as did other people in the room. You get the idea, no one gives a toss. 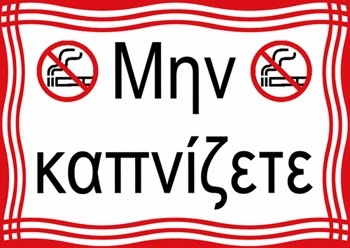 Yesterday, I was in the town post office which displays a sign saying "no smoking", but the man behind the counter was puffing away on his Karelia or some such Greek ciggy in between serving customers. To be fair nobody on the public side of the counter had a cigarette on the go so I suppose the sign was partially successful. I've been with our lawyer in a notary's office, again with the obligatory "no smoking" sign, and to give our lawyer his due, he did at least flick his cigarette ash out of the open window, but that was as far as it went. I have never actually seen anyone try to enforce no-smoking legislation although I have been told that occasionally the police will go in to a café and suggest it is a bit smoky inside. I am every smoker's biggest hate figure, an ex-smoker, but I am conflicted because I don't like to see the full force of government used to tell people what pleasures they can enjoy. Having said that, since living here I have come perilously close to taking up smoking again. Everyone does it, why shouldn't I? Well, put simply smoking is disgusting and dangerous. After my night at the taverna I coughed my way round my early morning walk with the dog. I suppose I shouldn't complain, I got a smoker's cough for nothing. More seriously, Greece has one of the highest rates of death from lung cancer in Europe. The highest rate is in Hungary - Yay! Go Hungary! And yes, I know, as every smoker says, usually as they're puffing away, "You've got to die of something." Maybe so, but if possible I'd give lung cancer a miss. you can ignore it - everyone else does.